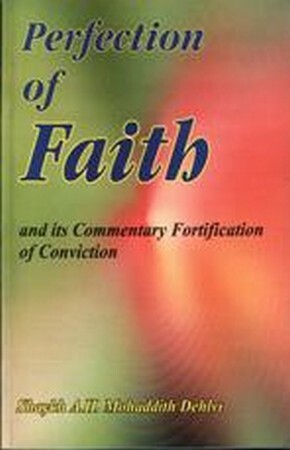 Written by one the most respected scholars of the Moghal era, this book is a concise and lucid presentation of the major articles of faith; one hundred and one articles of faith according to the Sunni orthodox way. The book was written in the Moghal era when the Emperor Akbar was trying to introduce the 'Din-e-Elahi' concept of mixing Islam with Hinduism, Sikhism and Buddhism. Now, when Islam is similarly challenged this book is again urgently needed. Shaykh Abd al-Haqq Muhaddith Dehlvi was born in 958 AH and passed away in 1052 AH, an accomplished and well respected Scholar of Islam during the Moghal Period in India whose works number over forty, include commentary on Hadith and Fiqh, history, tasawwuf, beliefs, Quranic sciences, and others. Moreover, the Shaykh was an accomplished poet. Yet, perhaps the most important matter of note for the reader of this translation is that the Shaykh was considered by his contemporaries to be the final authrity in Mughal India on matters of faith. This is especially noteworthy in view of the developments which took place at the court of the great Mughal Emperor, Akbar who patronized an attempt to synthesize the major religions in his realm, including Islam, Hinduism, Sikhism, Buddhism and others. Thus scholars of Islam were called upon time and agin to expound the doctrines of their faith, and to defend the faith from those who would interpret it to serve the interests of their masters. So it was in this atmosphere of inquiry and trial that the Shaykh produced his works, including this title. The translation was made from an edition of the book, the original Persian and Arabic, published in Delhi in 1341 A.H. (1923) by the Matba-i-Mujtabai.